Sanatan Mandir Cultural Centre (SMCC) is proud to offer dharma and culture-based education and activities for children and teenagers. Sanskrit prayers are actively taught through translations in Gujarati and English. Every child has that spark of divinity within. 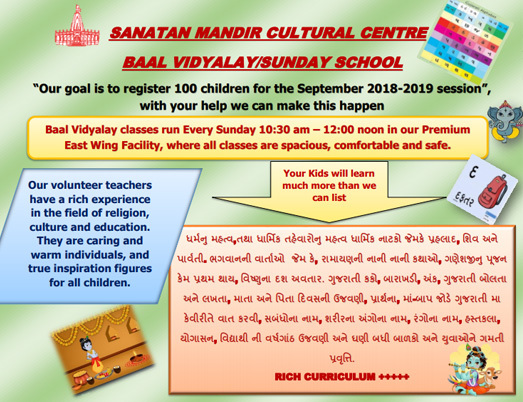 SMCC Baal Vidyaalay is a forum for children to discover and manifest that divinity. It enables Hindu children in Toronto to appreciate their cultural roots, learn Hindu values in an enjoyable manner and make good friends. They also develop a sense of Sewa (Service) to mankind. To teach children the basics of Gujarati Language so that they can communicate with their family members and other children their age with ease. Develop social awareness and leadership skills among children. Our Sunday classes are open to all children over age five and teenagers. Sanatan Mandir celebrates the spirit of Christmas with children and youth. The afternoon is filled with fun activities and food. Gifts are given out by our own Santa! For further information, please contact : Pravinbhai Shah ( +1 905- 472-8310).